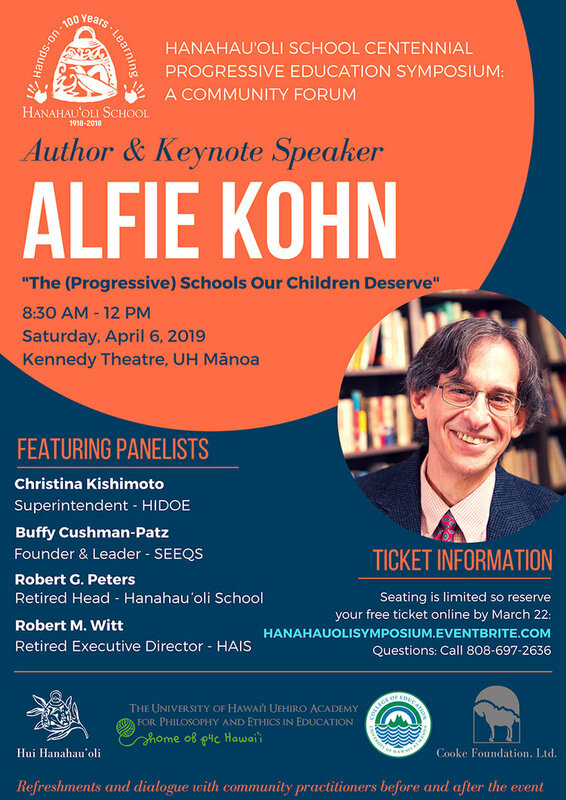 Hanahau'oli School cordially invites the community to engage in a morning of deeper conversations about progressive education, its relevance today and the future. Enjoy a keynote by internationally renowned speaker and author, Alfie Kohn. Kohn writes and speaks widely on human behavior, education, and parenting. The author of fourteen books and scores of articles, he lectures at education conferences and universities as well as to parent groups and corporations. Kohn’s criticisms of competition and rewards have been widely discussed and debated, and he has been described in Time magazine as “perhaps the country’s most outspoken critic of education’s fixation on grades [and] test scores.” His keynote will explore alternatives to conventional educational practices, explaining why progressive education isn’t just a realistic alternative but one that’s far more likely to help kids become critical thinkers and lifelong learners. It will be followed by a panel of local educational leaders, professional dialogue, and book signings. The event is free, however seating is limited so please register by March 22.